GIW is the single source for all of your centrifugal slurry pumping needs. With High Performance Corbrasion™ Resistance, the GIW LCC Pump family withstands the most severe slurry applications. Whatever the duty, it’s no challenge for the pump tailored to take on any slurry pumping condition. Design and Technology The hydraulic wet end consists of three components: a shell or casing, an impeller that screws onto the shaft and a suction plate/liner to permit easy assembly and disassembly for maintenance and inspections. The LCC-M slurry pump does not require a separate outer housing. LCC Extra-Heavy, Metal Series (LCC-H) Extra-heavy, hard metal LCC slurry pumps feature heavier sections and modified hydraulics. They are suited for severe slurry duties and feature two-stage pressure capability. LCC-H slurry pumps are available in six to 12 inch (150 to 300 millimeters). Impellers are cast of hard metal or polyurethane. Design and Technology The LCC Rubber-Lined Series features a split-casing design with molded, replaceable rubber liners. The molded liner may be specified in a variety of natural and synthetic rubbers. Natural gum rubber is standard. The liners offer a shore-A hardness of 30-40 with a tensile strength minimum of 2,700 psi (18 n/mm2). The LSA-S offers all-metal pumps with proven, long-wearing designs. The LSA-S ‘s modular design affords a high degree of interchangeability between metal and elastomer wear parts and mechanical components. This interchangeability simplifies your maintenance programs and allows you to vary operating conditions at minimal cost. Design and Technology Horizontal end suction construction. 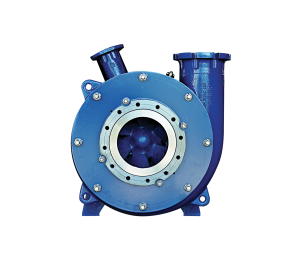 Single wall pump shell with replaceable suction side liner; four vane impeller orthree vane option for larger size solids. GIW delivers non-stop solutions for boosting productivity and profits. The MDX pump, the heart of the mill circuit, tackles the most extreme duty conditions. The features of the MDX pump combine to create a head/quantity and efficiency curve critical for efficient mill operation. Up to 300 psi Pressure Rating: Thicker cross sections translate into long and reliable pump service life. Deep Base Circle: Minimizes aggressive particle impingement providing a sliding wear action. Typical abrasive wear drops dramatically. Oversize Shrouds: Enhanced vane performance provides added clearing action minimizing recirculation and wear between the impeller and suction liner. Patented Inlet 5V Impeller: Designed to handle both liquid and solid phases within the slurry to maximize pump performance and wear life. Slurry Diverter: GIW’s latest technology dramatically increases suction liner life by reducing particle recirculation between the impeller and liner. Adjustable Suction Liner: Extended suction liner wear life maximizes productivity and minimizes cost by matching operating cycle times with scheduled mill outages. The TBC design can achieve very high pressures because the pressure load against the liners is transferred to the non-wearing side plates, which are held together by large tie bolts. Features slurry diverter for long wear life. Patented design incorporates state-of-the-art hydraulics and wear technology for heavy duty, high pressure applications. The pump shell is designed to reduce bending moments and associated stresses that can cause a structural failure during a pressure surge. GIW heavy-duty vertical pumps are the answer for the most aggressive corrosive and abrasive slurry applications. These rugged pumps combine long wear life with high sustainable hydraulic efficiency for the lowest total cost of ownership. Design and Technology Wear components are available in a wide range of proprietary hard iron alloys along with rubber and urethane linings to meet any application. The V-Belt drive system accepts high horsepower motors and the structural parts can be ordered in corrosion resistant alloys. Performance and efficiency, plus easy maintenance provide the best value with a GIW Vertical Slurry Pump. ISO 9001 registered for superior quality in design, production, and service, GIW uses state of the art computer programs with CAD design and analysis to develop new products. These are tested in the largest and most sophisticated slurry test facility in the world to produce the best pump for any application. Q m³/h 1,360 The LCV series is ideal for industrial process pumping, tailings disposal in mining, and pit use for dredge and other operations. GIW vertical pump solutions provide performance and efficiency at great value. The ZW series, with minimal service requirements, yields an economical answer for abrasive slurries. cartridge bearing assembly with integral mounting flanges. This provides accurate alignment with easy maintenance. GIW’s HVF (High-Volume Froth) pump provides continuous operation without shutdown or operator intervention. The new hydraulic design actually removed air from the impeller eye while the pumps is running — so you can keep your process moving. Fresh, innovative design reduces downtime by up to six hours. GIW’s straightforward tie-bolt and clamp design is a breeze to install and maintain. Seven fasteners are all that is needed for a complete rebuild. A twist-to-lock option simplifies apex removal and service, and drop-in, glue-free liners reduce build time. By adding weep holes for early wear detection, customers can virtually eliminate unplanned outages. The GIW Hydrocyclone is available in eight sizes, ranging from 2.5 inches to 33 inches. Repairs and rebuilds can be performed in place or on a build stand. The apex is the highest wear part of the cyclone. This section is subjected to a high concentration of coarse solids travelling at a high velocity. GIW now offers a patented long wearing design that allows a replacement apex to be fitted to your existing equipment. Change out can be reduced from hours to minutes. Contact your regional sales representative to learn how you can replace your high wear lower cones and apexes with durable, long life GIW apex kits.